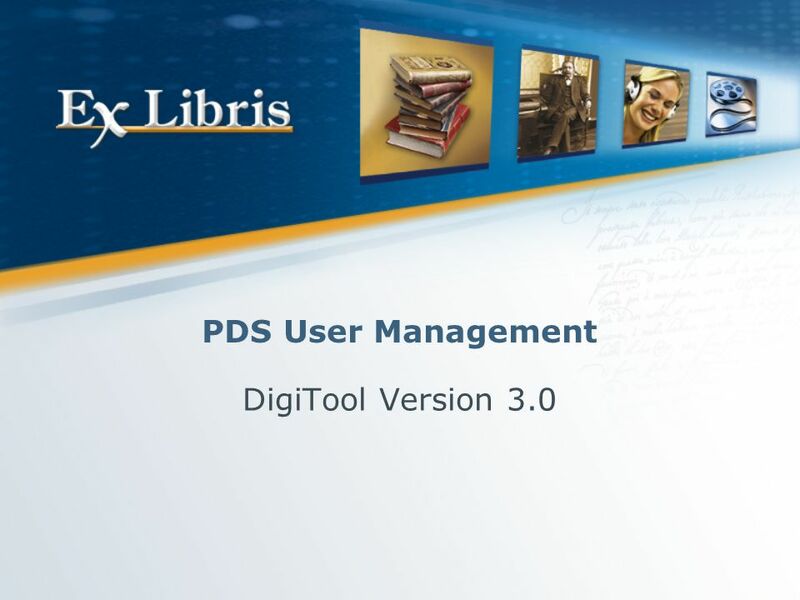 PDS User Management DigiTool Version 3.0. 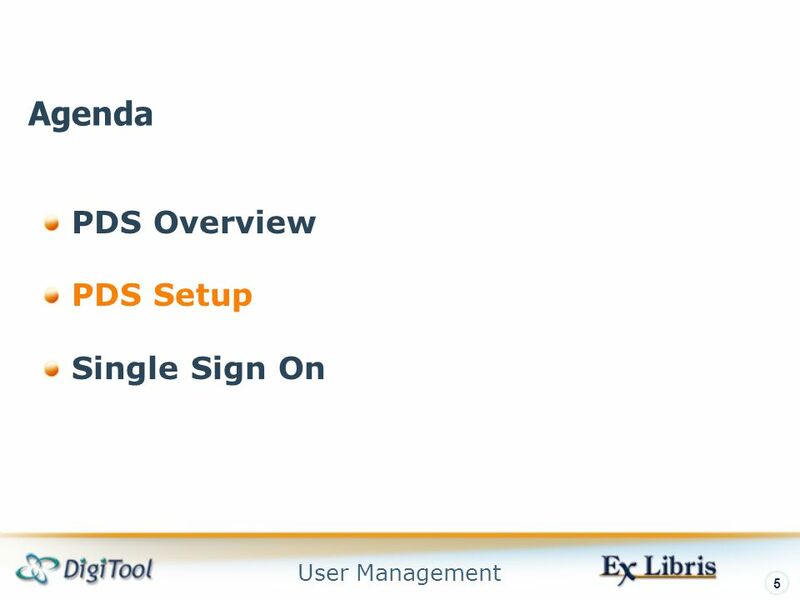 User Management 2 PDS Overview PDS Setup Single Sign On Agenda. 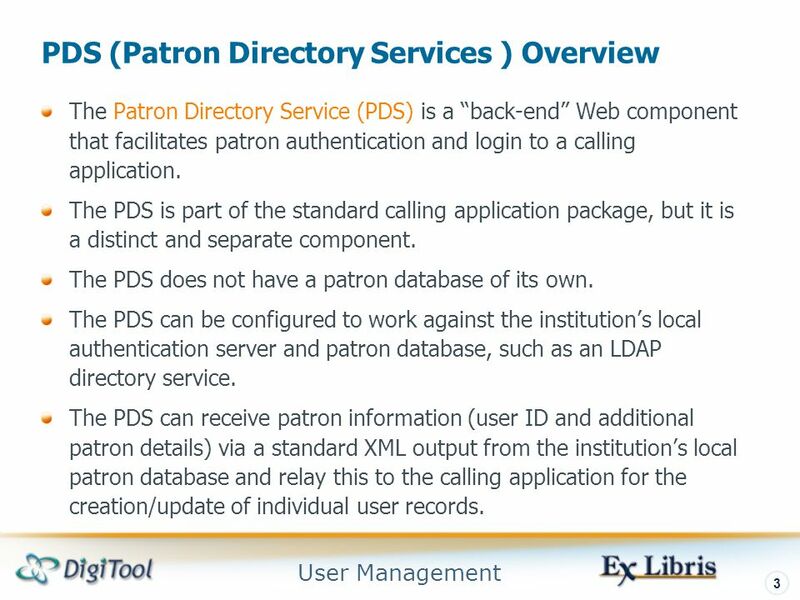 3 User Management 3 PDS (Patron Directory Services ) Overview The Patron Directory Service (PDS) is a “back-end” Web component that facilitates patron authentication and login to a calling application. The PDS is part of the standard calling application package, but it is a distinct and separate component. The PDS does not have a patron database of its own. The PDS can be configured to work against the institution’s local authentication server and patron database, such as an LDAP directory service. 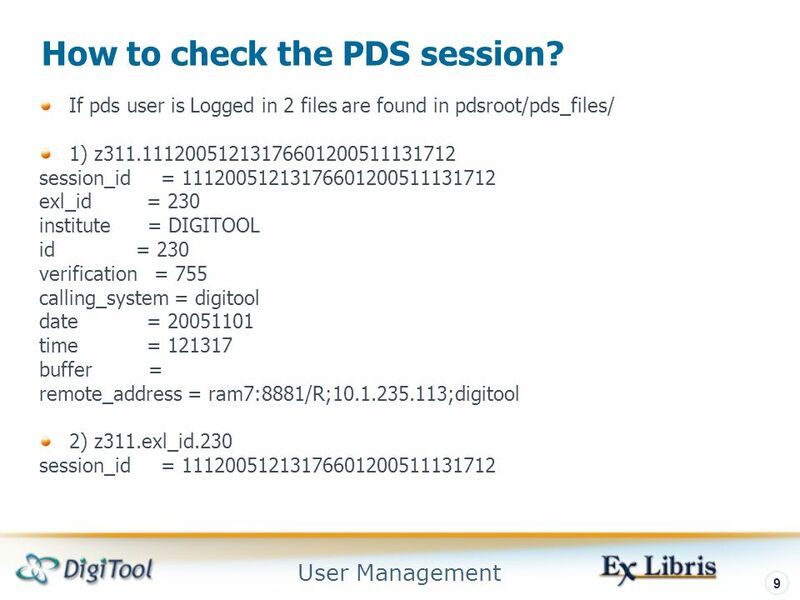 The PDS can receive patron information (user ID and additional patron details) via a standard XML output from the institution’s local patron database and relay this to the calling application for the creation/update of individual user records. 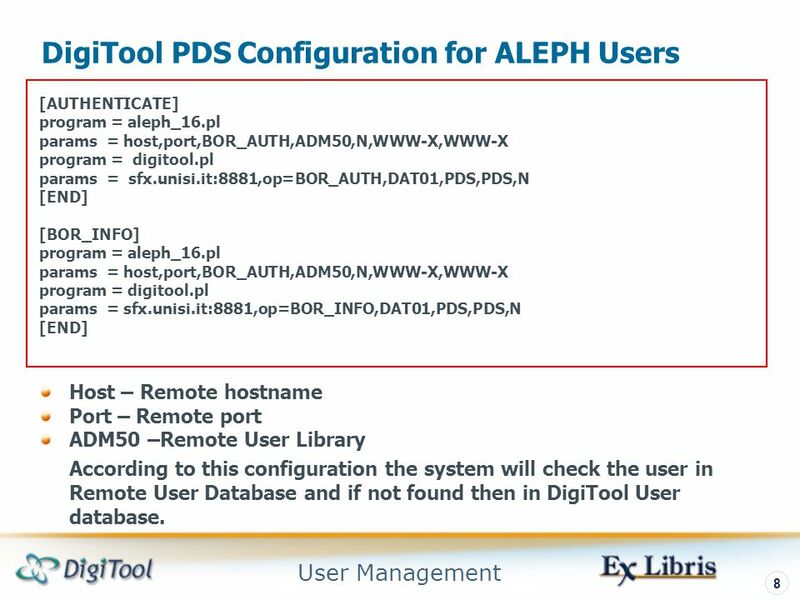 8 User Management 8 DigiTool PDS Configuration for ALEPH Users [AUTHENTICATE] program = aleph_16.pl params = host,port,BOR_AUTH,ADM50,N,WWW-X,WWW-X program = digitool.pl params = sfx.unisi.it:8881,op=BOR_AUTH,DAT01,PDS,PDS,N [END] [BOR_INFO] program = aleph_16.pl params = host,port,BOR_AUTH,ADM50,N,WWW-X,WWW-X program = digitool.pl params = sfx.unisi.it:8881,op=BOR_INFO,DAT01,PDS,PDS,N [END] Host – Remote hostname Port – Remote port ADM50 –Remote User Library According to this configuration the system will check the user in Remote User Database and if not found then in DigiTool User database. 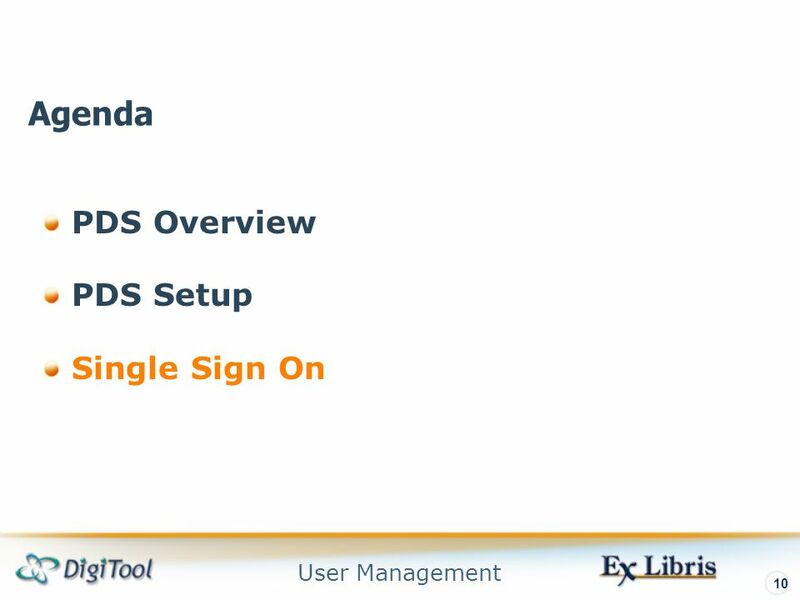 11 User Management 11 Single Sign On Overview PDS supports Single Sign On and Single Sign Off across Ex Libris products. 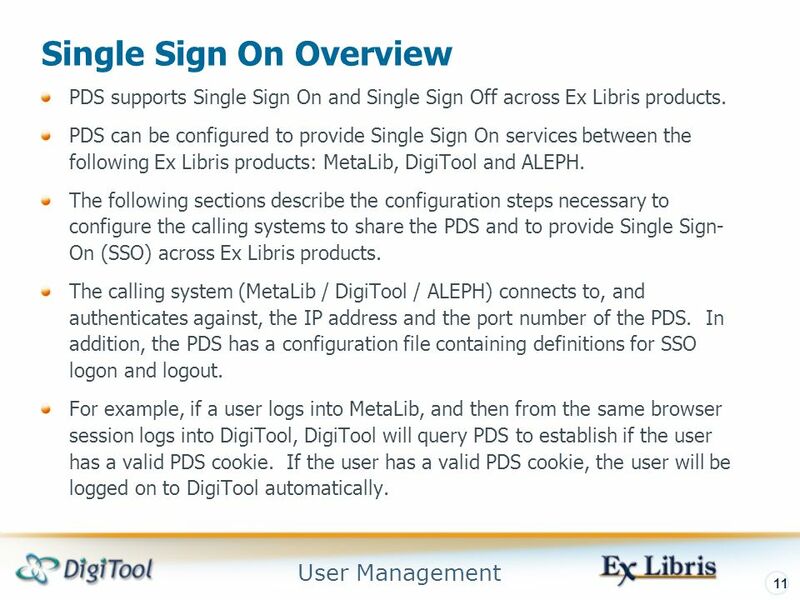 PDS can be configured to provide Single Sign On services between the following Ex Libris products: MetaLib, DigiTool and ALEPH. 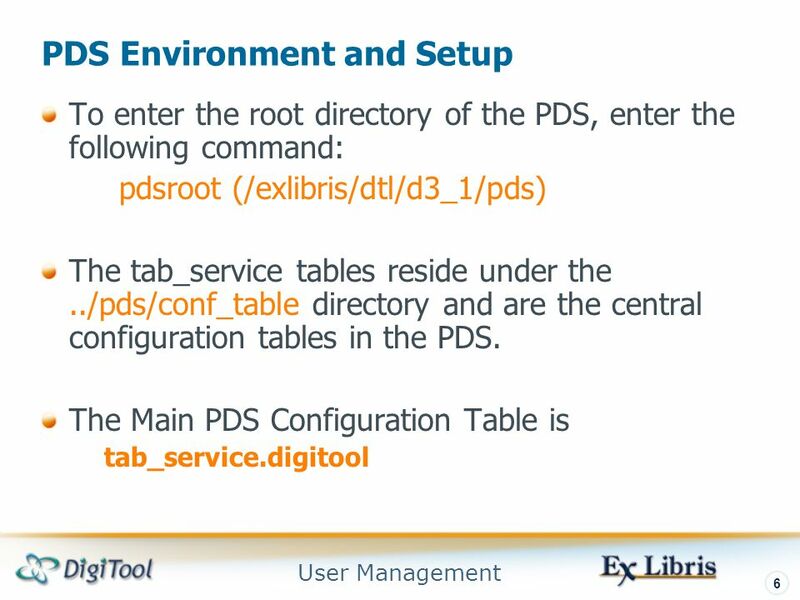 The following sections describe the configuration steps necessary to configure the calling systems to share the PDS and to provide Single Sign- On (SSO) across Ex Libris products. The calling system (MetaLib / DigiTool / ALEPH) connects to, and authenticates against, the IP address and the port number of the PDS. 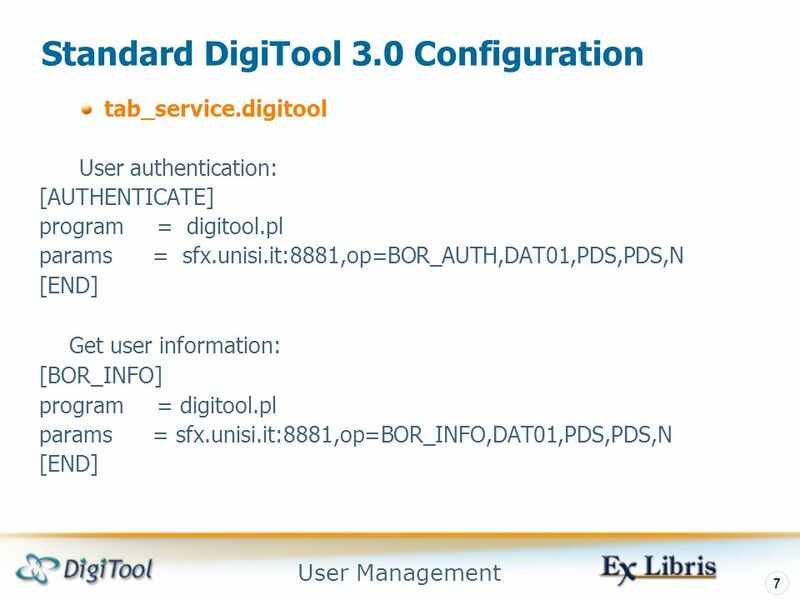 In addition, the PDS has a configuration file containing definitions for SSO logon and logout. 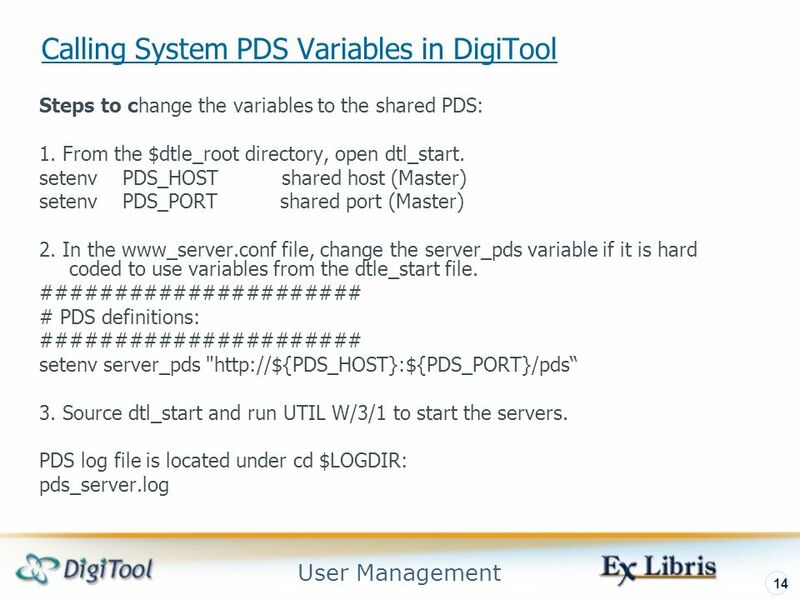 For example, if a user logs into MetaLib, and then from the same browser session logs into DigiTool, DigiTool will query PDS to establish if the user has a valid PDS cookie. If the user has a valid PDS cookie, the user will be logged on to DigiTool automatically. 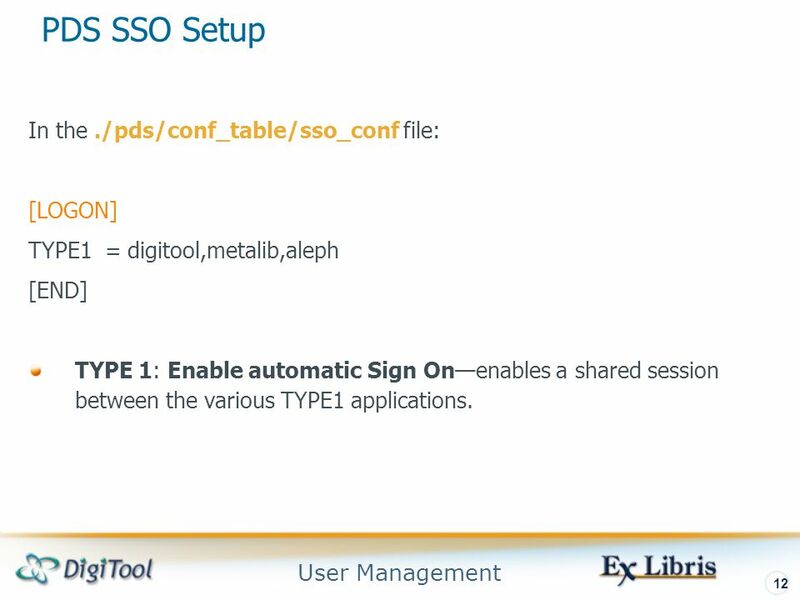 12 User Management 12 PDS SSO Setup In the./pds/conf_table/sso_conf file: [LOGON] TYPE1 = digitool,metalib,aleph [END] TYPE 1: Enable automatic Sign On—enables a shared session between the various TYPE1 applications. 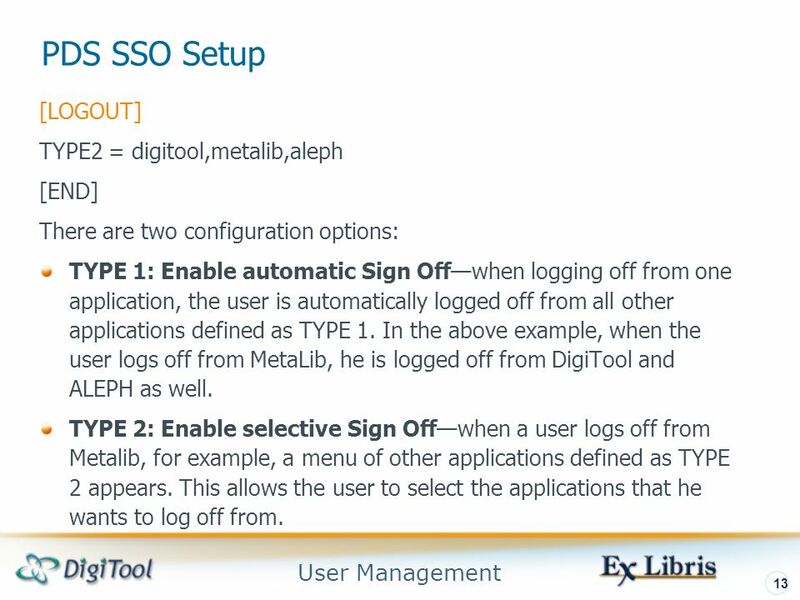 13 User Management 13 PDS SSO Setup [LOGOUT] TYPE2 = digitool,metalib,aleph [END] There are two configuration options: TYPE 1: Enable automatic Sign Off—when logging off from one application, the user is automatically logged off from all other applications defined as TYPE 1. In the above example, when the user logs off from MetaLib, he is logged off from DigiTool and ALEPH as well. TYPE 2: Enable selective Sign Off—when a user logs off from Metalib, for example, a menu of other applications defined as TYPE 2 appears. This allows the user to select the applications that he wants to log off from. 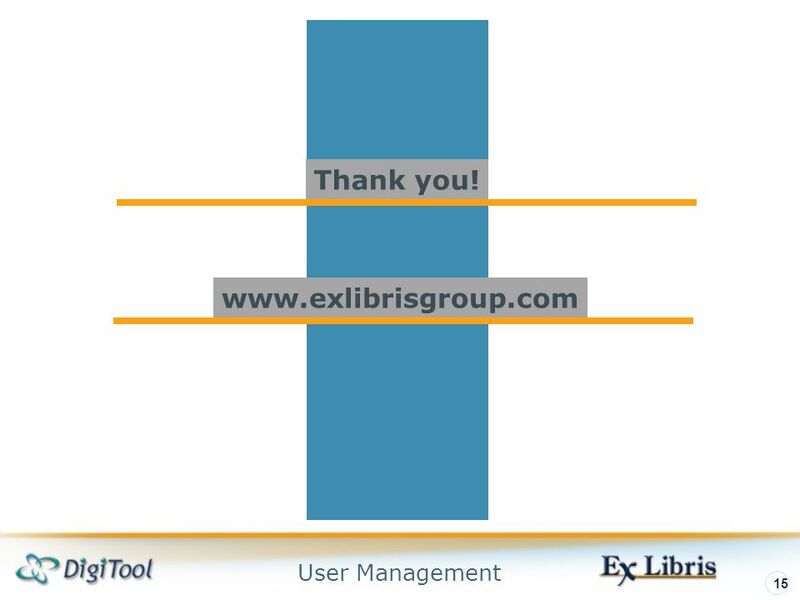 15 User Management 15 www.exlibrisgroup.com Thank you! 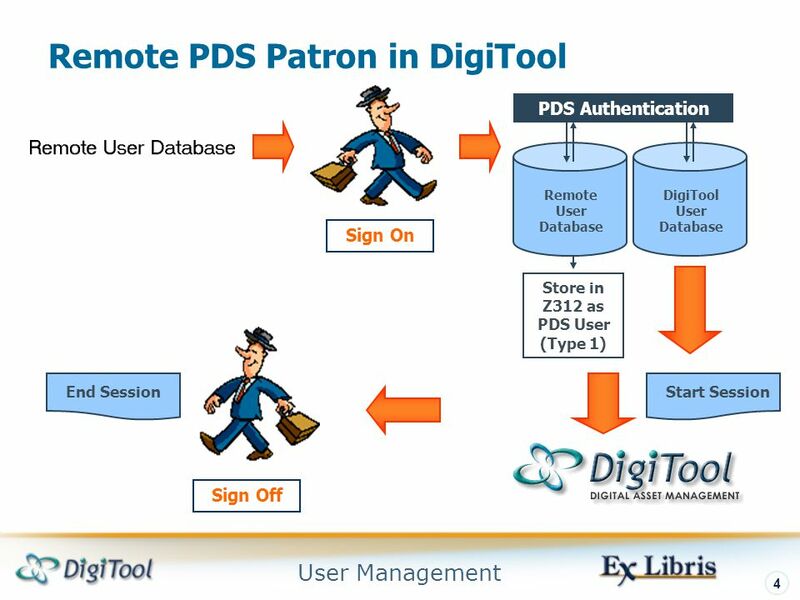 Download ppt "PDS User Management DigiTool Version 3.0. 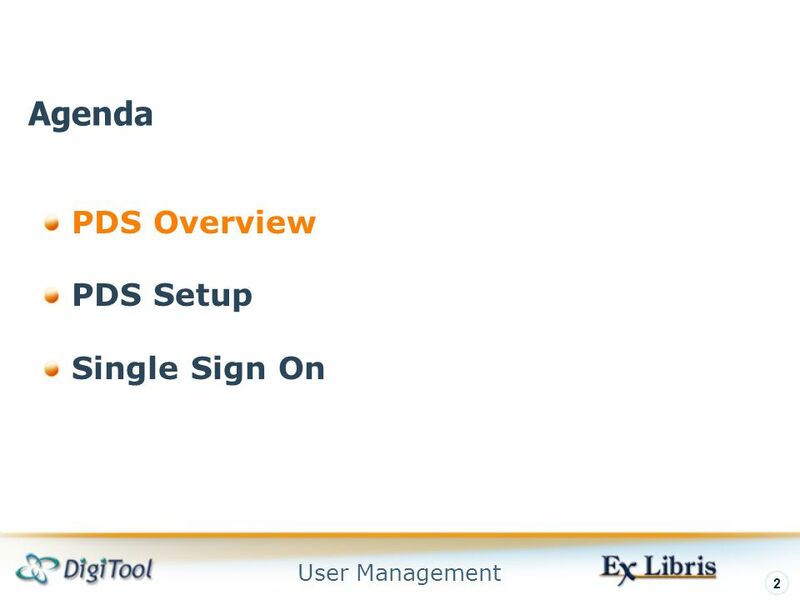 User Management 2 PDS Overview PDS Setup Single Sign On Agenda." Copyright © 2008 Pearson Education, Inc. Publishing as Pearson Addison-Wesley Chapter 15 Introduction to Rails. BIBC Member ID Card System By Lizette Burger. 2 BIBC REQUIREMENTS In the interest of all employers and employees, Council has instituted a system to provide. 1 Welcome to JCCAA Data base presentation Click box to see the DEMO 1.JCCAA Web Site 2. Member Login 3. My Acount 4. School DBA The end. Vanderbilt Business Objects Users Group 1 Linking Data from Multiple Sources. © Tally Solutions Pvt. Ltd. All Rights Reserved 1 Shoper 7.2 Interface with Tally.ERP 9 January 2010. ESafe Reporter V3.0 eSafe Learning and Certification Program February 2007. OAI in DigiTool DigiTool Version 3.0. Module 6: Configuring Windows XP Professional to Operate in a Microsoft Network.